ONH may occur as an isolated defect or in association with other ocular abnormalities (microphthalmos, aniridia, coloboma, nystagmus, and strabismus), cranial abnormalities (agenesis of septum pellucidum, anenephaly, midline abnormalities of brain) or facial anomalies. It may occur as a component of the syndrome of septo-optic dysplasia (de Morsier's syndrome), which includes midline brain malformations and hypopituitarism. 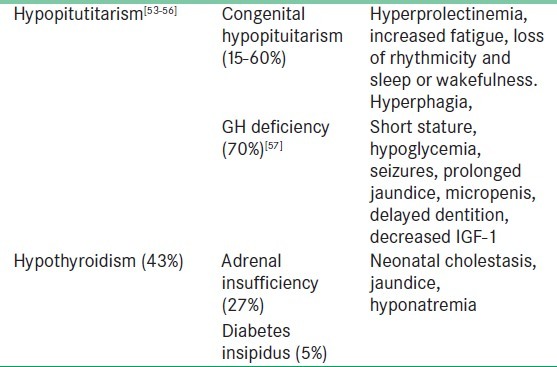 ONH should also be suspected in all infants with signs of hypothalamic dysfunction or vision impairment as adverse outcomes can often be avoided with early intervention. The correlation of macular lesions with the segmental involvement of the papilomacular axons is so specific as to suggest that ONH may result from ascending as well as descending neuronal death. 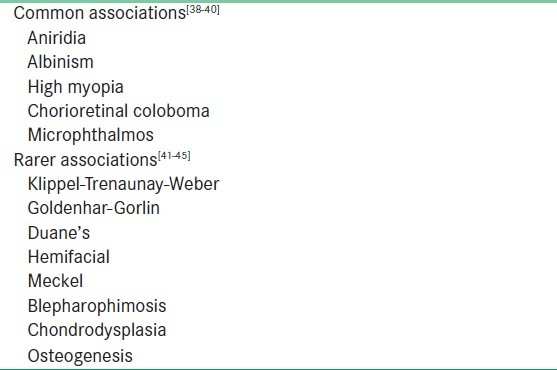 The following genes are believed to be involved in ON development - netrin, POUF1, PROP1, SF-1, PITX2, NeuroD1, GATA-2, LHX3, TPIT, SOX3, SOX2, and HESX1. Of these mutations, only HESX1 is reported to affect optic nerve development as well as anterior pituitary gland formation in humans. However, HESX1 mutations were found to be present in less than 1% of cases of ONH. Recent studies have reported association of superoxide dismutase with segmental hypoplasia. Thus, a specific genotype/phenotype correlation has not yet been found to explain the majority of cases of ONH. They have no other systemic abnormalities but only inferior visual field defects. They may have accompanying superior halo, superior neuroretinal thinning or superior disc pallor indicating maternal diabetes. Unilateral hemispheric lesions in the post-chiasmatic part of optic pathway may cause hemioptic homonymous visual field defects and hypoplasia. There appears to be little correlation between size of the optic nerve and its visual function. Visual acuity ranges in a wide spectrum from no light perception to near normal. ONH is a stable condition as far as vision is concerned. Visual function does not deteriorate with time. A mild improvement in visual function may occur as the result of maturation of the visual pathways. Patients may have no difficulties in work or other daily activities, the discovery of visual field defects may lead to the late diagnosis of ONH in patients with normal visual acuity. Diagnosis of ONH is primarily clinical. No current laboratory or radiographic tests establish the diagnosis. The most common mistake is labeling patients of ONH as optic atrophy. Hence, a careful clinical examination is a must. 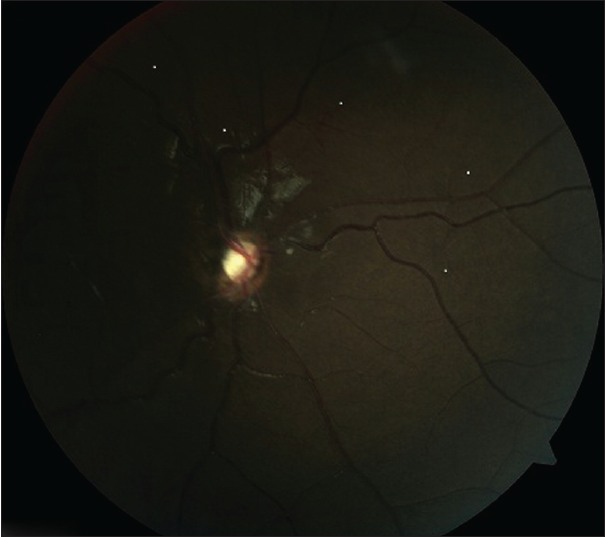 In an infant, examination with sedation or general anesthesia, including fundus photography, may be required to differentiate ONH from optic atrophy. The diagnosis of ONH in the extreme case is not usually difficult to make. The disc substance is markedly reduced and usually surrounded by an area of bare, exposed sclera which appears to coincide with the gap between the retinal pigment epithelial border and where a normal-sized disc should have extended. The retinal nerve fiber layer is variably thinned, and the disc itself may appear grayish or even white in color [Figure 1]. Vascular signs-Tortuous retinal vessels may accompany ONH. This may affect arterioles, venules, or both. Alternatively, the vessels may be uncommonly straight with decreased branching. Many authors believe that none of these signs is pathognomonic. Frisen and Holmegaard  stated that in mild ONH, the disc may be normal in diameter and that the double-ring sign may not be seen. Vascular tortuosity is also an inconsistent feature. Detection of nerve fiber layer thinning is not feasible in the neonatal period. Thus, diagnosis of milder degrees of ONH is problematic, and even more so in the premature neonate. Child may have mild photophobia, avoid light by restricting participation in outdoor activities. Electro-retinograms (ERGs) and electro-oculogram to flash stimuli are typically normal in ONH (due to normal photoreceptors in ONH). The amplitude of the visual evoked response (VER) is commonly reduced. Severe bilateral cases of ONH which present in early infancy may need to be differentiated from conditions such as achromatopsia and Lebers amaurosis. In these cases, the demonstration of a normal ERG response in the presence of an abnormal VER can be of critical diagnostic importance. Abnormalities that have been reported in some cases of ONH may suggest retinal dysfunction distal to the ganglion cell layer. ONH may occur as an isolated pathology or along with neurological or hormonal abnormalities. Hormonal problems not apparent in early life may appear later. Hormonal insufficiencies include thyroid, growth hormone (GH), pituitary, adrenal, and anti-diuretic hormone (ADH) deficiency. The risk of hormonal imbalances increases in cases where both eyes are affected, and/or if midline brain defects are present. Hormonal deficiencies, however, may also occur in mild, unilateral cases, with no evidence of brain anomalies. Children with unilateral ONH are at significant risk for hypothalamic/pituitary dysfunction (69%)  and developmental delay (39%), although they are at lower risk than those bilaterally affected (81% and 78%, respectively). Behaviors of some children with ONH may be due to associated medical conditions, such as inattentiveness and irritability due to hypoglycemia. ONH is seen in 25% of cases of agenesis of the septum pellucidum. Conversely, 27% of patients with ONH had partial or complete absence of the septum pellucidum. This condition is known as septo-optic dysplasia. The neurological features of this condition are mental retardation, spasticity, abnormalities of taste, and impaired smell. , Midline anomalies of the brain and other neurological associations: Anencephaly, cerebral atrophy, basal encephalocoeles, hypoplasia of the cerebellar vermis, cystic dilatation of the 4 th ventricle, posterior fossa cysts, and anterior visual pathway space occupying lesions including tumors. ,, Developmental delay often occurs in affected children. A retrospective review of 100 patients with ONH showed developmental delay in 32% and cerebral palsy in 13%. Patients with bilateral ONH and abnormal gray or white matter development had a higher rate of developmental delay (65%) than those without abnormalities (35%). Most common association is septo-optic dysplasia or "de Morsier's syndrome." This condition was first described in 1956 by the Swiss neurologist De Morsier. In 1970, the American ophthalmologist Hoyt and his co-workers described the association between septo-optic dysplasia and hormonal insufficiency. All pituitary hormones can be affected due to defects of the hypothalamus, infundibulum, or the pituitary gland itself. The hormones affected and the associated clinical features are summarized in [Table 2]. Endocrinologic work-up should include fasting morning cortisol and glucose, thyroid-stimulating hormone, free T4, IGF-1, IGFBP-3, and prolactin. If the child is less than six months of age, luteinizing hormone, follicle-stimulating hormone, and/or testosterone levels should be checked in order to anticipate delayed sexual development. Children should be monitored at least twice a year for growth. With growth deceleration, thyroid function tests should be repeated and a GH stimulation test should be performed. Free T4 should be rechecked annually for at least four years. If fasting cortisol is low, it should be repeated or provocative testing for cortisol should be done. Children with inadequate cortisol response to provocative tests should be given cortisol for administration during illness or physical stress. Occupational, physical, and/or speech therapy are frequently needed by children with ONH. Attention should especially be given to an early development of oral motor skills and acclimation to textured foods for those children resistant to eating. The diagnosis of congenital ONH is of great importance because of the genetic and systemic implications. The ophthalmologist has the opportunity of being the first to diagnose an underlying disease or syndrome and referring patients for genetic and pediatric assessment. In children with ONH, vision development may be delayed. This means that they may have been perceived as blind in the first few months of life, but that vision improves to a certain extent up to two years of age. It is recommended that children with bilateral ONH, nystagmus, and poor vision should undergo a thorough neuroradiographic and endocrine examination. Based on the high incidence of structural brain malformations, which may be associated with an increased risk of endocrinopathy and developmental delay, it is advisable that neuroimaging of the brain is advisable in all patients with ONH. CT accurately delineates the altered anatomy of septo-optic dysplasia. The vision of young children with ONH should be monitored at least annually, and any refractive errors should be treated when the visual acuity reaches a functional level. Amblyopia treatment can result in improvement of vision in the worse eye. Early surgical correction of strabismus is needed for children who have symmetrical functional vision in the eyes, and thus have some potential for binocularity. Otherwise, correction of strabismus should be deferred until it is a psychosocial issue. Although there is no cure or treatment per se, the purpose of early intervention programs and early vision stimulation programs is to minimize the impact of the vision loss on general development in patients of ONH. 1. Lambert SR, Hoyt CS, Narahara MH. Optic nerve hypoplasia. Surv Ophthalmol 1987;32:1-9. 2. Brodsky MC Congenital optic disk anomalies. Surv Ophthalmol 1994 39:89-112. 3. Magnus H. Zur Karuistik der angelborenen Schnerven-milbildungen. Klin Monatsbl Augenheilkd 1884;2:85-7. 4. Little LE, Whitmore PV, Wells TW. Aplasia of the optic nerve. J Pediatr Ophthalmol 1976;13:84-8. 5. Reeves DL. Congenital absence of the septum pellucidum. Bull Johns Hopkins Hosp 1941;69:61-7. 6. DeMosier G. Etudes sur les dystrophies cranio-encephaliques. III. Agenesie du septum lucidum avec malformation du tractus optique: La dysplasia septo-optique. Schweiz Arch fur Neurol Psychiatr 1956;77:267-92. 7. De Morsier G. Median cranioencephalic dysraphias and olfactogenital dysplasia. World Neurol 1962;3:485-505. 8. Kaplan SL, Grumbach MM, Hoyt WF. A syndrome of hypopituitary dwarfism, hypoplasia of the optic nerves and malformation of prosencephalon: Report of six patients. Pediatr Res 1970;4:480-1. 9. Clark EA, Meyer WF. Blindness and hypoglycemia. Growth hormone deficiency with septo-optic dysplasia. Tex Med 1978;74:47-50. 10. Schwartz O: Ein fall von Mangelhafter beider Sehnerven. Arch Ophthalmol 1915;90:326-8. 11. Hoyt WF, Rios-Montenegro EN, Behrens MM. Homonymous hemioptic hypoplasia. Br J Ophthalmol 1972;56:537-45. 12. Scheie HC, Adler FH. Aplasia of the optic nerve. Arch Ophthalmol 1941;26:61-70. 13. Gross H, Hoff H. Sur les malformations ventriculares dependantes des dysgenesies comissurales. Malformations congenitales du cereveau 1959:329-51. 14. McCulley TJ, Mayer K, Dahr SS, Simpson J, Holland EJ. Aniridia and optic nerve hypoplasia. Eye (Lond) 2005;19:762-4. 15. Hotchkiss M, Green WR. Optic nerve aplasia and hypoplasia. J Pediatr Ophthalmol 1979;16:225-40. 16. Stellwagen D, Shatz CJ. An instructive role for retinal waves in the development of retinogeniculate connectivity. Neuron 2002;33:357-67. 17. Tajima T, Hattorri T, Nakajima T, Okuhara K, Sato K. Sporadic heterozygous frameshift mutation of HESX1 causing pituitary and optic nerve hypoplasia and combined pituitary hormone deficiency in a japanese patient. J Clin Endocrinol Metab 2003;88:45-50. 18. Hackenbruch Y, Meerhoff E, Besio R, Cardoso H. Familial bilateral optic nerve hypoplasia. Am J Ophthalmol 1975;79:314-20. 19. Novakovic P, Taylor D, Hoyt W. Localising patterns of optic nerve hypoplasia-Retina to Occipital lobe. Br J Ophthalmol 1981;72:176-9. 20. Mark B, Garcia-Filion P. The syndrome of optic nerve hypoplasia. Curr Neurol Neurosci Rep 2008;8:395-403. 21. Benner JD, Preslan MW, Gratz E, Joslyn J, Schwartz M, Kelman S. Septo-optic dysplasia in two siblings. Am J Ophthalmol 1990;109:632-7. 22. Sandbach JM, Coscun PE, Grossniklaus HE, Kokoszka JE, Newman NJ, Wallace DC. Ocular pathology in mitochondrial superoxide dismutase (Sod2)-deficient mice. Invest Ophthalmol Vis Sci 2001;42:2173-8. 23. Acers TE. Optic nerve hypoplasia: Septo-optic-pituitary dysplasia syndrome. Trans Am Ophthalmol Soc 1981;79:425-57. 24. Kim RY, Hoyt WF, Lessell S, Narahara MH. Superior segmental optic hypoplasia. A sign of maternal diabetes. Arch Ophthalmol 1989;107:1312-5. 25. Garcia ML, Ty EB, Taban M, Rothner AD, Rogers D, Traboulsi EI. Systemic and ocular findings in 100 patients with optic nerve hypoplasia. J Child Neurol 2006;21:949-56. 26. Skarf B, Hoyt CS. Optic nerve hypoplasia in children: Association with anomalies of the endocrine and CNS. Arch Ophthalmol 1984;102:62-7. 27. Zeki SM, Dutton GN. Optic nerve hypoplasia in children. Br J Ophthalmol 1990;74:300-4. 28. Zeki SM, Dudgeon J, Dutton GN. Reappraisal of the ratio of disc to macula/disc diameter in optic nerve hypoplasia. Br J Ophthalmol 1991;75:538-41. 29. Hellstrom A, Wiklund LM, Svensson E. Diagnostic value of magnetic resonance imaging and planimetric measurement of optic disc size in confirming optic nerve hypoplasia. J AAPOS 1999;3:104-8. 30. Awan KJ. Ganglionic neuroretinal aplasia and hypoplasia: Aplasia and hypoplasia of optic nerve. Ann Ophthalmol 1976;8:1193-202. 31. Wakakura M, Alvarez E. A simple clinical method of assessing patients with optic nerve hypoplasia. The disc-macula distance to disc diameter ratio. Acta Ophthalmol 1987;65:612-7. 32. Alvarez E, Wakakura M, Khan Z, Dutton GN. The disc-macula distance to disc diameter ratio: A new test for confirming optic nerve hypoplasia in young children. J Pediatr Ophthalmol Strabismus 1988;25:151-4. 33. Edwards WC, Layden WE. Optic nerve hypoplasia. Am J Ophthalmol 1970;70:950-9. 34. Martyn LJ, DiGeorge A. Selected eye defects of special importance in pediatrics. Pediatr Clin North Am 1987;34:1517-42. 35. Frisen L, Holmegaard L. Spectrum of optic nerve hypoplasia. Br JOphthalmol 1978;62:7-15. 36. Hellström A, Wiklund LM, Svensson E. Diagnostic value of magnetic resonance imaging and planimetric measurement of optic disc size in confirming optic nerve hypoplasia. J AAPOS 1999;2:104-8. 37. Brodsky MC, Glasier CM. Optic nerve hypoplasia. Clinical significance of associated central nervous system abnormalities on magnetic resonance imaging. Arch Ophthalmol 1993;11:66-74. 38. Layman PR, Anderson DR, Flynn JT. Frequent occurence of hypoplastic optic discs in patients with aniridia. Am J Ophthalmol 1974;77:513-6. 39. Spedick MJ, Benchamps GR. Retinal vascular and optic nerve anomalies in albinism. J Pediatr Ophthalmol Strabismus 1986;23:58-63. 40. Skarf B, Hoyt CS. Optic nerve hypoplasia in children. Association with anomalies of the endocrine and CNS. Arch Ophthalmol 1984;102:62-7. 41. Margolis S, Aleksic S, Charles N, Budzilovich G. Retinal and optic nerve findings in Goldenhar-Gorlin syndrome. Ophthalmology 1984;91:1327-33. 42. Denslow GT, Sims M. Duane's retraction syndrome associated with optic nerve hypoplasia. J Pediatr Ophthalmol Strabismus 1980;17:26-8. 43. MacRae DW, Howard RO, Albert DM, Hsia YE. Ocular manifestations of the Meckel syndrome. Arch Ophthalmol 1972;88:106-13. 44. Lloyd L, Buncic JR. Hypoplasia of the optic nerve and disc. In: Smith JL, editor. Neuro-ophthalmology focus. New York: Mason; 1980. p. 85-96. 45. Levine R, Snyder A, Sugarman G. Ocular involvement in chondrodysplasia punctata. Am J Ophthalmol 1974;77:851-9. 46. Birkebaek NH, Patel L, Wright NB, Grigg JR, Sinha S, Hall CM et al. Endocrine status in patients with optic nerve hypoplasia: Relationship to midline central nervous system abnormalities and appearance of hypothalmic-pituitary axis on magnetic resonance imaging. J Clin Endocrinol Metab 2003;88:5281-6. 47. Borchert M, McCulloch D, Rother C, Stout AU. Clinical assessment, optic disk measurements, and visual-evoked potential in optic nerve hypoplasia. Am J Ophthalmol 1995;120:605-12. 48. De Morsier G. Agenesis du septum lucidum avec malformation du tractus optique. Schweiz Arch Neurol Psychiatr 1956;77:267-92. 49. Benner JD, Preslan MW, Gratz E, Joslyn J, Schwartz M, Kelman S. Septo-optic dysplasia in two siblings. Am J Ophthalmol 1990;109:632-7. 50. Roberts-Harry J, Green S, Wilshaw H. Optic nerve hypoplasia: Associations and management. Arch Dis Childhood 1990;65:103-6. 51. Taylor D. Congenital tumours of the anterior visual system with hypoplasia of the optic discs. Br J Ophthalmol 1982;66:455-63. 52. Garcia ML, Ty EB, Taban M, Rothner AD, Rogers D, Traboulsi EI. Systemic and ocular findings in 100 patients with optic nerve hypoplasia. J Child Neurol 2006;21:949-56. 53. Brodsky MC. Congenital optic disk anomalies. Surv Ophthalmol 1994;39:89-112. 54. Siatkowski RM, Sanchez JC, Andrade R, Alvarez A. The clinical, neuroradiographic, and endocrinologic profile of patients with bilateral optic nerve hypoplasia. Ophthalmology 1997;104:493-6. 55. Kaufman LM, Miller MT, Mafee MF. Magnetic resonance imaging of pituitary stalk hypoplasia. A discrete midline anomaly associated with endocrine abnormalities in septo-optic dysplasia. Arch Ophthalmol 1989;107:1485-9. 56. Sorkin JA, Davis PC, Meacham LR, Parks JS, Drack AV, Lambert SR. Optic nerve hypoplasia: Absence of posterior pituitary bright signal on magnetic resonance imaging correlates with diabetes insipidus. Am J Ophthalmol 1996;122:717-23. 57. Ahmad T, Garcia-Filion P, Borchert M, Kaufman F, Burkett L, Geffner M. Endocrinological and auxological abnormalities in young children with optic nerve hypoplasia: A prospective study. J Pediatr 2006;148:78-84. 58. Levene MI, Williams JL, Fawer CL. Ultrasound of the infant brain. Oxford: Blackwell Scientific; 1985. p. 92.